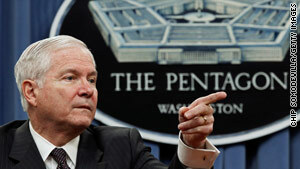 Robert Gates wants the upcoming defense spending bill vetoed if funding for certain projects are included. Washington (CNN) -- Defense Secretary Robert Gates says he will urge President Obama to veto a coming $726 billion defense authorization bill if it contains funding for unwanted projects Gates has been trying to cut for years. Gates has been vocal about financial reform at the Pentagon, trying to rein in some big-ticket contracts and telling Congress to stop spending money on C-17 transport planes that are not needed and a $485 million alternate engine for the F-35 Joint Strike Fighter (JSF). The JSF engine program -- already delayed and over budget -- could end up costing taxpayers billions of dollars, according to Gates. But with jobs at stake, Congress has ignored those requests for years and continued to appropriate funds for the C-17 and a second F-35 engine. "The detailed conditions they [Congress] have imposed on the overall JSF program would make it essentially un-executable and impose unacceptable schedule and budget costs," Gates said Thursday at a Pentagon briefing. "As I have stated repeatedly, should the Congress insist on adding funding for a costly and unnecessary JSF extra engine or direct changes that seriously disrupt the JSF program, or impose additional C-17 aircraft, I will strongly recommend that the president veto such legislation," he said. The Pentagon believes the proposal for the new engine, made by General Electric, would end up costing about $2.9 billion which includes re-working the engine already being tested because there is concern it does not meet the performance needs for the F-35. Those costs would be picked up by taxpayer dollars, according to Pentagon estimates. Additionally the contract for the new proposal by Congress would require cutting the purchase of the current engine by half to let the General Electric engine purchase catch up, according to Gates. "Only in Washington does a proposal where everybody wins get considered a competition, where everybody is guaranteed a piece of the action at the end," Gates said. "Yes, we're in favor of competition, but my idea of competition is winner takes all, and we don't have that kind of a situation here," he continued. The House Armed Services Committee passed the bill Wednesday. The bill must be approved by the entire House then matched by a Senate version and signed by Obama before becoming law.